On Saturday night, Bernie Sanders, Hillary Clinton, and Martin O'Malley went head-to-head in the third Democratic debate in New Hampshire — the last of 2015 for both parties. While important issues like how to defeat ISIS and the Sanders campaign's recent data breach scandal were enthusiastically discussed, Sanders' most Larry David moments of the debate made it increasingly clear that the Vermont senator is slowly morphing into his Hollywood doppelganger. In heated moments, Sanders' and David's native Brooklyn drawls (yes, they're even from the same place) sound very similar, and the expressions Sanders used sounded like they could have come straight from David's mouth. After David impersonated Sanders in a presidential debate on Saturday Night Live in October, the two white-haired men's resemblance has been undeniable. Maybe it's simply that once an idea hits your radar, you notice the topic much more, but it seemed like Sanders was acting more and more like David throughout the debate. Of course, Sanders' signature hand gestures — the finger point, the outstretched arms — were not lacking; however, his way of speaking sounded very similar to David's speech. 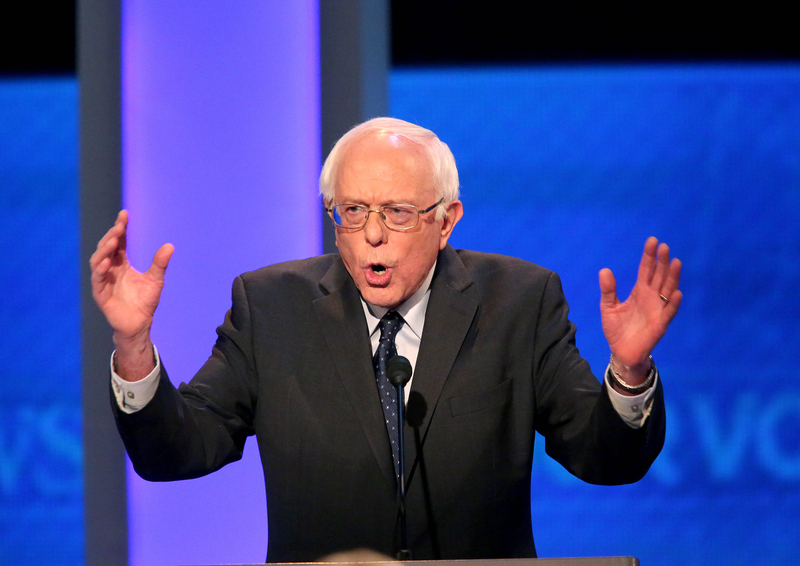 So, here are Sanders' most David-esque moments of the third Democratic debate on Saturday. Nothing sounds more Brooklyn than "eh, forget it," except maybe "New Yawk." Sanders' pronunciation of Qatar sounded more like "Cuttah," which is probably how David says it. (I can't say for sure, as, sadly, I've never personally discussed Qatar with the comedian). Well, this is just getting confusing. When asked if Corporate America will love a President Sanders, the senator responded: "No, I think they won't." David would definitely be this blunt if on stage himself. "Calm Down A Little Bit"
After the former governor of Maryland got worked up asserting that Sanders and Clinton have flip-flopped on gun legislation, Sanders said: "Whoa, whoa, whoa. Calm down a little bit, Martin." OK, this didn't actually happen in the debate, but it does sound like a joke David would make. Even in satirical tweets, they are the same man.